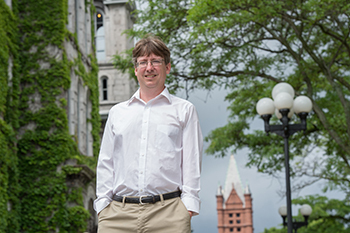 Ben Bradley, the Allan and Anita Sutton Distinguished Chair of Philosophy in the College of Arts and Sciences, is the author of a new book titled “Well-Being” (Polity Press, 2015). It’s Bradley’s third book project. An A&S faculty member for more than a decade, he also is a philosophy professor and the director of the integrated learning major in ethics. In “Well-Being,” Bradley guides readers through the various philosophical theories of well-being, such as hedonism, perfectionism and pluralism, showing the benefits and drawbacks of each theory. He explores the role of well-being in moral and political theory, as well as the limitations of welfare-based approaches to ethics, such as utilitarianism and welfare egalitarianism. Finally, he introduces puzzles about well-being that arise in moral and prudential deliberations about procreation and death. An expert in ethics and in philosophy of death, Bradley earned a Ph.D. from the University of Massachusetts at Amherst. He has held academic positions at Princeton University, Western Washington University, Virginia Polytechnic Institute and State University, and Illinois Wesleyan University. His other books are “The Oxford Handbook of Philosophy of Death” (Oxford University Press, 2012) and “Well-Being and Death” (Oxford: Clarendon Press, 2009). He also is a frequent contributor to top scholarly journals, including Philosophical Studies, Journal of Ethics and Social Philosophy, Utilitas and Ethics.